In most Arduino projects, relays are the first choice to drive some large current device. It requires a certain amount of current to drive the internal coil to pick-up contact. But for some MCU, like Intel Edison, Intel joule, lilypad, Raspberry Pi and other microcontroller with limited amount of current GPIO, it’s hard to drive one or more relays simultaneously. The MOSFET power controller is a module which can drive a large current device with limited current GPIO. It works as a MOSFET relay or MOSFET driver. When you give it a digital high-level signal (3.3~10V), MOSFET turns on, vice versa. Compare to the relay module, MOSFET power controller is compatible with Arduino Raspberry Pi, Lattepanda and other Microcontroller, supports 3.3~10V logic power control. The VIN port supports 5~36V; 0~20A power input, if the current is over 10A, we recommend an external heat sink. And MOSFET supports quick ON-OFF switch, the switching frequency arrives 1KHz. That is a good point for robot control. 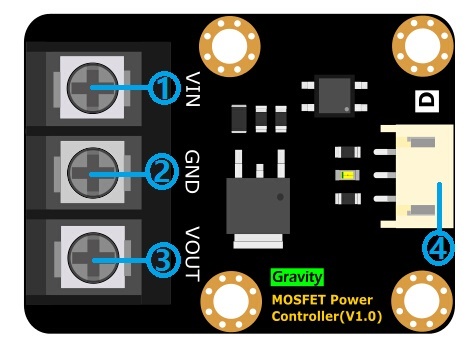 The MOSFET power controller comes with a standard PH2.0-3P gravity interface. It makes the module compatible with the Arduino IO expansion shield. Plug and play, easy to use. 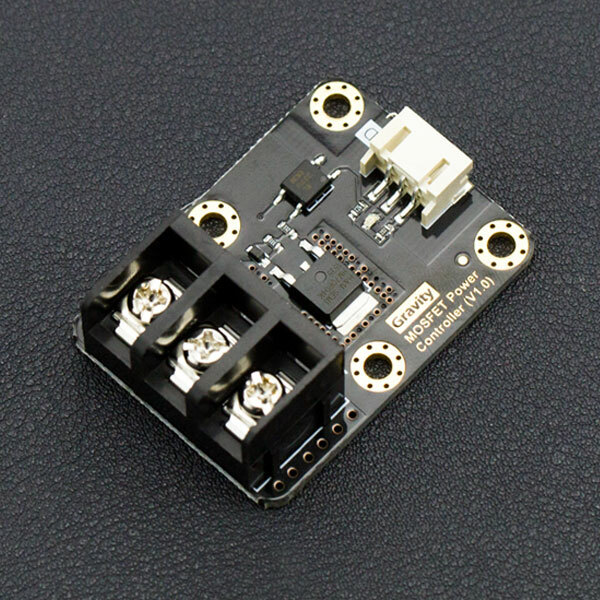 Mounting Hole Size: inner diameter 3.1mm/0.12"; outer diameter 6mm/0.24"
Get Gravity: MOSFET Power Controller from DFRobot Store or DFRobot Distributor.